Provides knowledge of cryptocurrency to the Peruvian public. Encourage people to invest in cryptocurrency. Create one of Peru’s largest mining farms. Teach based on the guided visit to the mining farm how the mining machine works. Bits2U is the company responsible for creating and maintaining the website and future projects. The country, Peru, is the 39th largest economy in the world. It’s a saving of $ 200 billion. With only a small percentage of it transferred into cryptocurrency, and aggressive marketing to entice people to invest and have a competitive advantage, Bits2u predicts that their concept will have a huge positive impact on the perucoin, the crypto-currencies and the Republic of Peru. Bits2u intends to educate Peruvian citizens about blockchain technology, mining and cryptocurrency by creating a mining farm to which the public and Peruvian foreigners have guided access so they can enjoy the mining process, while discovering and learning crypto-currency and perucoin in particular. The Perucoin runs on the Ethereum blockchain and therefore scrupulously complies with the security and privacy laws provided by the blockchain. The main objective of Bits2U is to raise awareness among the Peruvian public and foreigners about increased awareness of Cryptocurrency and Perpetual (PE). Bits2u will encourage and motivate Peruvians and foreigners to invest and make transactions with cryptocurrencies and in particular Perucoin, thus inspiring the use of cryptocurrency as legal tender in both digital and physical commercial transactions . Bits2u intends to build one of the largest mining farms in the world in Peru and allow guided tours of the mining farm. In this way, they hope to be able to teach mine visitors to exploit the mines, which will help demystify the work processes of the mining plants and show them how the crypto-ecosystem works. By guaranteeing a location, Bits2u will ensure the authenticity of the coin and encourage its quick adoption by enthusiasts. PeruCoin Ecosystem provides a safe and decentralized platform for teaching and promoting knowledge about crypto-currencies in Peru. At the same time, they strive to eliminate the distrust and fear of investing in crypto-currencies from the Peruvian public. They also plan to create a specialized platform on crypto-currency, crypto-investment, blocking technology. 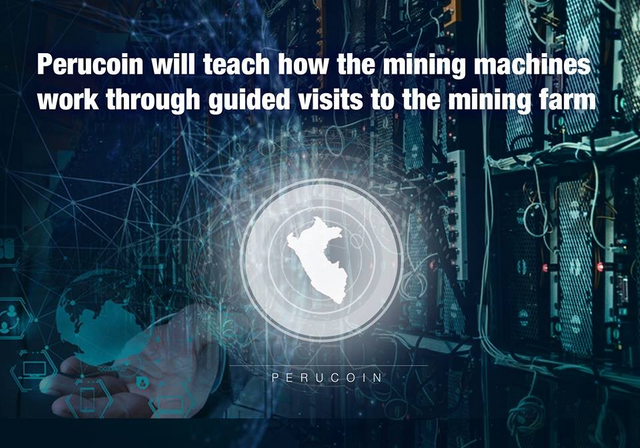 PeruCoin’s vision is to promote the knowledge about cryptocurrencies to the Peruvian population through guided visits to a factory where they can appreciate the technicalities and operations of the mining machines in action and through conferences. We plan to achieve this byeducating and increasing the awareness of the general Peruvian population on the benefits and safety of blockchain technology and adopting digital currencies. Ideally, we envisage driving the development of a new financial ecosystem in Peru grounded in the interactions between educating the populace and interactions ofblockchain technologyand assets management. equipped, both directly and through relationships, to execute marketing campaigns which will spread message and position PeruCoin brand as a dominant player in the Peruvian cryptocurrency. Most of the team members on PeruCoin have LinkedIn profiles. This is all good because the more transparency a company have in regard to their team, the more trustworthy they typically are. NOTE: This article is just a guide to potential clients, stakeholders and everybody itching for a snip of this wonderful project and its published regarding bounty campaign. I am not a project team member or its representative but a supporter of this incredible project. The whitepaper will provide an in-depth and thorough analysis of this wonderful project. You can click on the link below and find out more about this wonderful project.